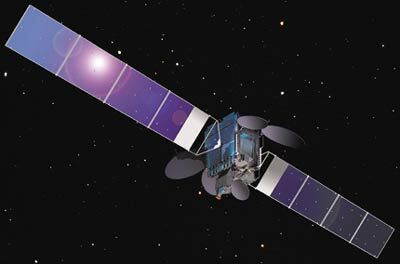 From its 110° West longitude orbital position, EchoStar VIII's spot-beams will allow a more efficient use of spectrum, enabling EchoStar to expand its DISH Network local-into-local satellite TV service and increase in-orbit backup capacity. The successful launch of EchoStar VIII brings EchoStar's fleet to eight satellites, including two satellites previously built by SS/L. EchoStar VIII is designed to operate in several different payload modes using national and spot beams. The primary operating mode will provide 16 high-power national transponders at approximately 250 Watts RF and 25 spot beam transponders distributed among 16 beams. The spacecraft is based on SS/L's space-proven SSL-1300 geostationary satellite platform. The SSL-1300, which has an excellent record of reliable operation, is designed to achieve a long useful life, in this case 15 years, excellent station-keeping, and orbital stability by using bipropellant propulsion and momentum-bias systems. Solar arrays and batteries provide uninterrupted electrical power. Two of the 12 stationkeeping thrusters failed in September and October 2002. A workaround is used for station keeping but more fuel is being consumed.